How are your plans going for Maori Language Week 2013? This year’s theme is one every New Zealander can relate too: Ngā Ingoa Māori or Maori Names. New game for Māori Language Week 2013. He Papa-Whakataetae mō Ngā Wāhi Māori or Aotearoa Road Trip. We are into our third print run on our new board game specially designed for Maori Language Week 2013. No printing out and assembly needed with this game – just fold out and play, saving time for teachers and parents. At the same time we wanted to make it affordable without compromising on quality, so we paid particular attention to the graphics as well as how the game ‘plays’. I’ve lost count of the number of prototypes we tested. I think our test players (my kids) were thoroughly sick of us, but they came up with some excellent feedback. We’ve also tested it with older adults and children with visual and cognitive difficulties, and they too have provided valuable feedback which we have incorporated into successive prototypes. Even for those who are proficient speaking Te Reo Māori, the game challenges all players’ knowledge of New Zealand geography and encourages strategic thinking. Young players stand just as much chance of winning as adults, so the game engages players of all ages. The rules are deliberately simple, so game time is maximised. Depending on the number of players, it can take as little as 15 minutes to play or you can choose to play for a set time – making it ideal for class room situations. In addition to the board game, we are working on a new interactive whiteboard/computer resource and quiz to help lay the ground work with word recognition and pronunciation. Special thanks to our Māori language and cultural adviser, Bill Karaitiana, and the various tourism organisations throughout Aotearoa who have supplied us with beautiful scenic photos to use in all these resources. 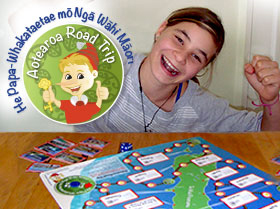 You can now place your order for the ‘Aotearoa Road Trip‘ board game. Check it out here. Great to see this up and running.